So what do these numbers mean for your business? You MUST optimise for mobile devices. Desktop viewing is to be a secondary thought, with all of the content you create being optimised for mobile viewing. Your videos must encourage viewers to watch until the end. Longer views, and repeated views, will boost your video rankings in YouTube. At the end of your videos, prompt viewers to check out your other videos on YouTube by displaying clickable thumbnails. Facebook’s recent announcement that all videos will soon auto play with sound was a big change to video marketing. It’s clear that Facebook is wanting to deliver engaging video content to users, and they believe that sound is a critical part of that. So every video you create MUST include an engaging audio track. Subtitles allow users to watch video content regardless of where they are, even when their device is set to “sound-off”. With mobile video overtaking traditional desktop video, more and more people are electing to mute their mobile device, so they can watch videos in public places without fear of an embarrassing video blasting sound for everyone around them to hear. The bottom line is people want control over how they consume video content, so let them choose! Create videos that have engaging subtitles alongside an engaging audio track - that way you’re optimising for both types of viewers. DMOZ have announced they will be shutting down in the coming weeks, and it’s the nail in the coffin for ‘old school’ SEO. If you don’t know what DMOZ is, it is an artefact of a bygone era in SEO. It was an online directory created to help boost SEO rankings back when Google was a simpler beast to conquer. Webmasters would submit their website to the DMOZ directory and in turn they’d generate backlinks to their website - and it was a simple way to give your SEO Rankings a boost. With Penguin and other recent Google algorithm updates, link building in this way has become harmful to your website, and is now a big no no. So what does the end of DMOZ mean for you? The good news is that it reiterates that creating valuable content and earning genuine backlinks is what you need to be focusing on. 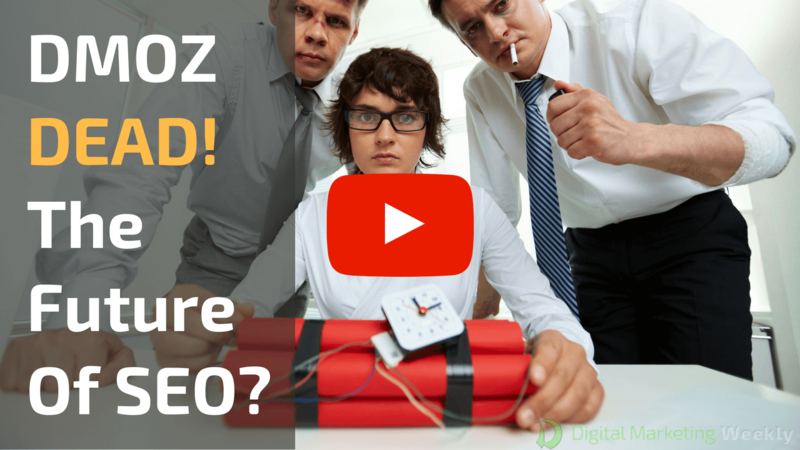 The hacks of old school SEO are no longer applicable, and will damage your SEO Rankings. Create content that delivers a great user experience, share your content in as many places as possible, and you’ll earn natural backlinks that will boost your SEO Rankings. Video newsletters are highly engaging, help build authority with you and your audience, and with the right tools can be done very quickly and easily. In Content Samurai Webinar #10 we’ll be showing you the exact process we use to create the DMW videos from start to finish!